Today I climbed Sugarloaf which wasn’t as difficult as I’d feared. My family left me on the trail just south of it this morning because my intention was to stay out and continue on towards Stratton then the Bigelows. I was having lunch atop the “Loaf”, marveling at the excellent cell reception when I received a tweet about a missing dog. Jumper is a 5 year old beagle that was doing a SOBO with his owner. 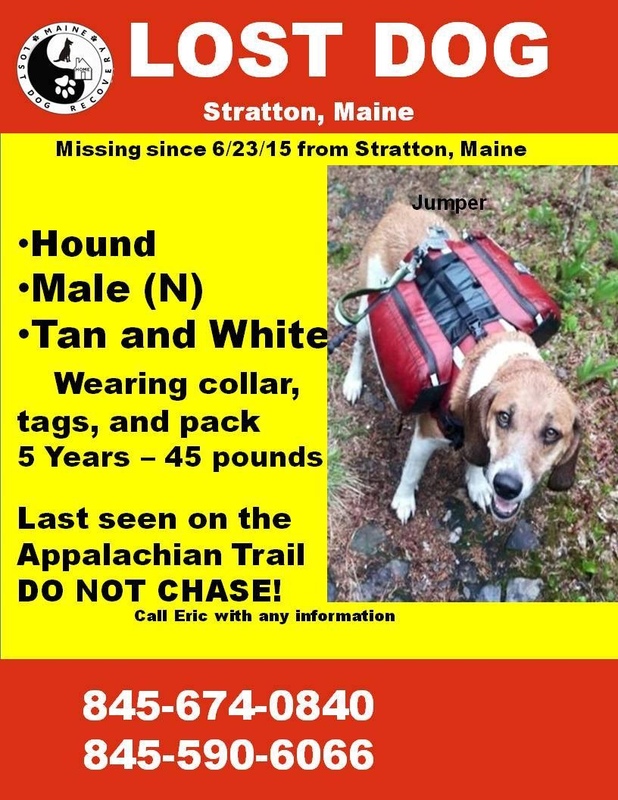 They’d made it through the 100 Mile Wilderness and most of the Western Mountain range when Jumper took off at the trailhead in Stratton on Sunday June 21. He had his pack and leash on which is what concerns me. I’m sure he could chew through his leash if it became tangled but the pack could become ensnared on one of the many pipe sized roots. I’m not sure he could get himself loose if that happened. I really can’t imagine what it must be like for his young owner – to be in a strange state far from home, extremely limited cellular signal, only the pack on his back and his dog is missing. So I made the decision to come home and print the “Lost Dog” picture that Maine Lost Dog Recovery posted online. I made 30 copies and have enlisted my family to go with me to Stratton early tomorrow morning so we can help this young man in his search. We’re getting on at the trail head with me heading north and daughter heading south, hanging flyers on trees and armed with hot dogs. Hubby will take the town section which is extremely small. Hopefully with extra eyes out there we can find Jumper. I was fortunate that his owner, Eric, reached a cell signal tonight and I was able to tell him my plan. Please say a prayer that Jumper is found safe and reunited with his owner. **I did get a lot of nice pictures and videos while at Sugarloaf which I’ll post over the weekend. Today I’m spent but very happy!